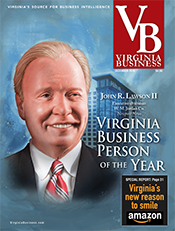 New leadership will guide a restructured Port of Virginia facing fierce competition. Each week, massive cargo ships stocked to capacity with U.S. exports set sail from the Port of Virginia, heading to the Middle East and then Asia. These ships, each almost the width of a football field and slightly longer than the Eiffel Tower is tall, draw up to 49.5 feet of water under their hulls, pushing up against the port’s 50-foot channel depths. Ships this size are calling on ports up and down the East Coast, but the Port of Virginia, with its deep and unobstructed sea lanes and channels, is the most capable of handling these vessels when fully laden. Since 2012, Mediterranean Shipping Co.’s Golden Gate Service has called twice at the Port of Virginia in each East Coast journey with these ships, which have a capacity of more than 9,000 TEUs (20-foot equivalent units). Hampton Roads is its second stop on the East Coast, but more importantly, also its last, when the ships load up on U.S. goods before heading back through the Suez Canal to Jeddah, Saudi Arabia, and then on to Asia. 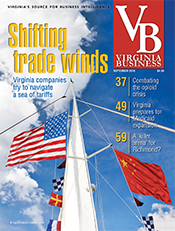 Port officials hope this pattern is a sign of things to come — as more shipping lines use Virginia’s deep harbors to handle their first-in or last-out calls on the U.S. East Coast, when their ships are at their fullest. 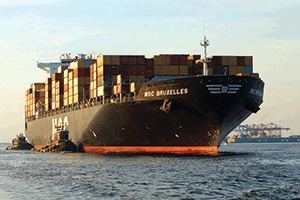 The Port of Virginia and the international maritime industry are at the helm of change. In the wake of its latest rejection of multibillion-dollar offers to privatize operations, the state-owned port is restructuring, trying to better align the port authority with its longtime operator, Virginia International Terminals (VIT). After a management shakeup and the adoption of a reorganized business model, the next generation of port leadership will navigate it into a new era of international shipping. The VPA board of commissioners could announce a new executive director of the port as soon as September. During the next few years, trade routes will adjust to the completion of an expanded Panama Canal (scheduled for 2015) and the increased use of these massive vessels in general (deemed “Post-Panamax” because they are too big to fit through the canal today). 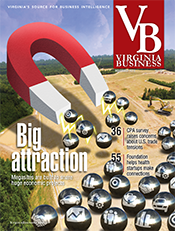 VPA and VIT are embarking on a new way to do business. 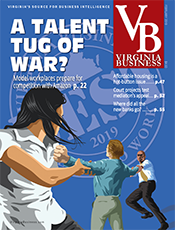 In March, for the second time in four years, the VPA board of commissioners chose to stick with VIT over private bidders who had offered billions to run port operations — a move that Fitch Ratings deemed was likely to prevent other major port privatization plans. 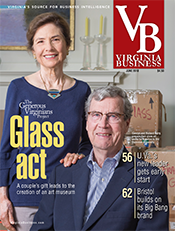 VPA, the political subdivision responsible for the state’s port facilities, created VIT as a nonstock, nonprofit corporation to manage Virginia’s consolidated maritime facilities in 1982. 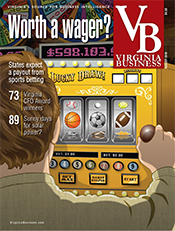 But after the latest round of bids, the VPA’s board of commissioners was interested in more than the status quo. While staying loyal to VIT, they also voted to restructure both organizations, hoping to save money, improve efficiencies and offer a more streamlined message. In legal terms, VIT is slated to become an LLC (limited liability company) after the port receives approval from the Internal Revenue Service and paperwork is filed with the State Corporation Commission. While each of the organization’s departments will be affected by some of the changes, the restructuring will impact senior management the most because of shifting responsibilities. In addition to Bridges’ departure, longtime VIT CEO Joe Dorto retired this year. The new executive director will oversee both organizations, and the VIT board of directors will serve in an advisory role only. The reorganization, however, will not mean major layoffs. Buyouts have been offered to some employees but only a handful were expected to accept. Any reduction in force is expected to be accomplished through attrition, according to Oliver. Not everyone was pleased by the decision to restructure the organizations. Three members of the VIT board of directors resigned after its decision to change operations. One of them, Bill Grace, says VIT’s independence is important because of its relations with labor unions and because its board is outside political decisions. In 2011, Gov. Bob McDonnell replaced 10 of 11 VPA board commissioners because he was disappointed with port performance. A port spokesman says labor relations would not be changed by the new structure because the Hampton Roads Shipping Association handles negotiations. 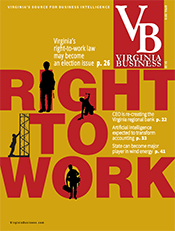 Meanwhile, the General Assembly’s watchdog, the Joint Legislative Audit and Review Commission (JLARC), is conducting a new study of port operations and Virginia’s competitiveness. A briefing on the report is expected in October. Another JLARC report earlier this year concluded that the port’s operations were fiscally sound and outperformed other East Coast ports during the 2008-09 recession but that VPA and VIT had redundancies, particularly in the areas of human resources and finance. The new study, according to Delegate S. Chris Jones, R-Suffolk, will provide a more in-depth look. “I felt it was critically important to get direction for reform but also have a study of the operations to see what efficiencies could be achieved that would help the port and the commonwealth,” he says. Amid turmoil at the port — caused by unsolicited private bids, changes in leadership and the start of the reorganization — its marine terminals had a record-setting year. 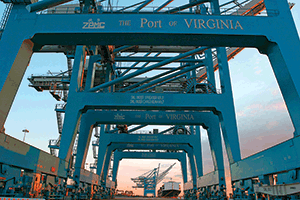 The Port of Virginia handled 2.165 million TEUs in fiscal year 2013, up 10 percent over the previous year. But can this last? Not everyone is optimistic about the port’s future in the race for international freight. 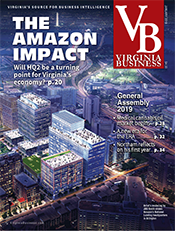 Some maritime observers believe it will become more difficult for the Port of Virginia to compete with New York and Savannah, the largest East Coast ports, particularly because Hampton Roads does not have access to a major population center. “Norfolk can’t overcome the natural advantage that New York has in terms of a population center, and as a practical matter, they can’t overcome the advantage Savannah has in terms of warehouses they have and the access to the Southern populations,” says Thomas Finkbiner, senior chairman of Intermodal Transportation Institute at the University of Denver. 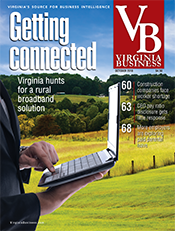 Virginia will face competition from other ports that want to match or get closer to its 50-foot depth. In anticipation of the Panama Canal expansion, East Coast ports are undergoing major infrastructure projects. Many maritime and logistics experts believe that canal expansion actually will have little effect on East Coast ports, which have used the event to justify spending billions of dollars beefing up facilities. 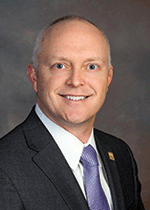 Shipping lines are unlikely to use a route that will take seven or eight days longer through the canal, says Finkbiner of the Intermodal Transportation Institute. Still, as more of these big ships are added into shipping line rotations, East Coast ports want to take advantage of them. Post-Panamax vessels coming from Southeast Asia, India and the Middle East already are calling on the East Coast through the Suez Canal. That is one reason Virginia’s port officials believe the Panama Canal expansion’s effects will be tempered on the East Coast. Large ships are already calling — well ahead of predictions. “Saying that, a 1 percent shift from the West Coast to the East Coast is significant for the East Coast ports,” says Oliver. Today, these massive ships make up about 16 percent of the worldwide container fleet but hold 45 percent of the fleet’s capacity, according to Col. Paul Olsen, commander of the Norfolk District for the U.S. Army Corps of Engineers, which maintains the shipping channels approaching the Port of Virginia. “By 2030, they are expected to make up 27 percent of the world’s container fleet, accounting for 62 percent of its capacity,” Olsen told the VPA board of commissioners at its meeting in July. The Port of Virginia was the first U.S. East Coast port to dredge its channels to 50 feet, but recently the Port of Baltimore established a single 50-foot-draft berth. The Port of New York, which is currently digging its channels to 50 feet, also needs to raise the Bayonne Bridge. Other ports, including Savannah, Charleston, Jacksonville and Miami, all are deepening their harbors to better handle big ships. 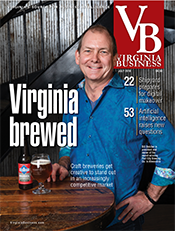 Virginia’s port officials recognize the competition, and they aren’t resting on their laurels. In addition to its restructuring, the Port of Virginia is working on a number of projects, large and small, to remain competitive. Virginia is the only port on the East Coast with authorization to dredge to 55 feet, which would require federal funding. The estimated cost would be $150 million to $175 million. Another project awaiting federal funds is construction of Craney Island in Portsmouth, a future marine terminal that eventually could handle 5 million TEUs once all four phases were built. So far, federal support remains in question for the $3 billion project. 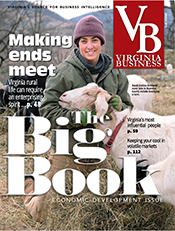 Virginia has contributed $73.9 million so far, while the federal government has spent $31 million. The federal and state governments are supposed to split the cost of the $900 million expansion of the foundation that will eventually hold the terminal. The port also has begun other initiatives to improve operations, such as updating technology and reworking truck gates at Norfolk International Terminals. In addition, the port authority hopes to be more aggressive in pursuing new business because of a law passed by the General Assembly giving it powers similar to an industrial development authority. The port also believes it will benefit from other proposed economic development projects in Virginia, such as construction of the new U.S. Route 460 connecting Hampton Roads with the Petersburg region and megasite developments along U.S. Route 58 in Southern Virginia. Port officials are hoping not only that their cranes are down, but that they continue reaching farther and farther out to load and unload containers from these massive ships.